This node creates a terrain using a Billowy noise generator. It is a standard modification of a Perlin noise generator node where each level of detail is transformed using the absolute value function. It creates slightly different patterns that are useful when creating creases and hills. To add a Billowy noise node, right click in the Graph Editor and select Create Node > Terrain Transformation > Billowy noise. The Scale parameter determines the horizontal scale of the noise. A smaller coefficient gives a higher density of "bumps"; a larger coefficient gives a lower density of bumps. Use the slider to set the horizontal scale of the terrain. In the example below, the scale is decreased and the terrain has more bumps. The Height parameter sets the vertical scale of the heights. Use the slider to set the terrain height. A smaller coefficient decreases range of the height of the vertices. A larger coefficient increases range of the height of the vertices, as shown in the example below. Number of levels: The default number of levels of detail is 8. Each level has double the frequency of the previous level. In the example below, the number of levels is reduced from 8 to 4. Attenuation: This corresponds to the attenuation of a level of detail against the previous one. If this value is low, the high-frequency levels of detail dominate and generate a high-frequency noise. If this value is high, the high-frequency levels of detail are less visible, as shown in the example below. This parameter pans the terrain in the X and Y axes. Enter a value in the X ands Y fields or use the arrow keys to pan horizontally and vertically. This parameter sets the value of the noise generation seed. Changing the seed value, even very slightly, completely changes the terrain shape. Enter a value in the Seed field. Click Generate to randomly generates a new seed. 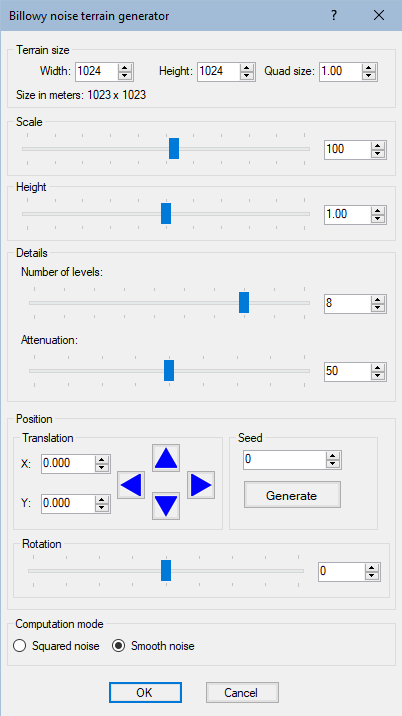 Use the slider to rotate the terrain from -180 to 180 degrees. Use the radio button to chose the underlying algorithm. Squared noise corresponds to the legacy implementation (a value noise with a linear interpolation between lattice points). Smooth noise corresponds to a more robust gradient noise. Nearly as fast as the squared noise, it produces smoother terrains without alignments or visual discontinuities. The difference is especially important when using few levels of details. Terrain size See "Part common to all generator nodes"
Scale Determines the horizontal scale of the noise. More this coefficient is small, the higher the density of "bumps"
Height Sets the vertical scale of the heights. Number of levels This corresponds to the number of levels of detail. Each level has a frequency twice as much as the previous one. Attenuation This corresponds to the attenuation of a level of detail against the previous one. If this value is low, the high-frequency levels of detail dominate and generate a high-frequency noise. If this value is high, the high-frequency levels of detail are less visible. Seed Initial value of the noise generation seed.